Anyone who keeps up with technology news has read about deep neural networks beating human champions at Go, achieving breakthrough accuracy at voice recognition, and generally driving today's major advances in artificial intelligence. Little has been said about the ways deep neural network approaches are quietly achieving analogous breakthroughs in intrusion detection. 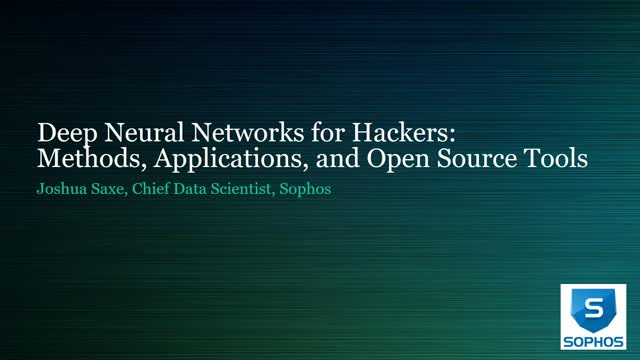 Join this webcast as we demystify deep neural network (deep learning) concepts and prove how predictive security can protect against unknown threats. Sophos XG Firewall gives you everything you need to secure your network against advanced threats like ransomware, bots, worms, hacks, breaches and APTs. In addition, you get unparalleled network visibility that no other firewall on the market can deliver. While big-name ransomware like WannaCry grabs the headlines, phishing is the cybercrime that’s consistently hooking organizations week in and week out. In fact, over 77% of organizations experience a phishing attack at least once a month. Join this live panel discussion with experts at AWS re:Invent 2018 for a deep dive into next-gen endpoint protection and cloud-managed network security. Join this one-on-one interview with Jeremy Snyder, VP Business Development, DivvyCloud and Bill Prout, Lead Security Architect - Public Cloud, Sophos for an in-depth discussion on the importance of simplicity and layered security when migrating to the cloud. - What kind of threats are impacting the public cloud? - What types of security solutions does Sophos have for AWS? - How has cloud security evolved over the past few years? - What's different about security in the cloud compared to on premise? - What are some considerations to keep in mind when architecting secure environments in the cloud? - What are some of the biggest challenges customers face when trying to secure their AWS environments? This on-camera interview will be live-streamed directly from AWS re:Invent in Las Vegas. Tune in from the comfort of your desk! Join Peter Mackenzie as he discusses the rise of targeted ransomware and why attacks like SamSam, Dharma and BitPaymer are making headlines. Watch a live demo of a ransomware payload being unleashed and the steps you need to protect your organization from similar attacks. Smart hackers coordinate their attacks across your system. Now, you can learn how to outsmart the hackers by coordinating your defenses! Synchronized Security is a best-of-breed security system that enables security solutions to talk to each other, sharing information and responding automatically to threats. For example, if the endpoint detects a threat, the firewall automatically isolates the infected computer and then the cleanup kicks right in to finish the job. The Roman Catholic Diocese of Brooklyn is the seventh largest organization of its kind in the U.S. It serves more than 1.5 million Catholics living in Brooklyn and Queens and includes 187 parishes and approximately 90 schools. This complex, multifaceted organization turned to Sophos to unify and simplify its endpoint, firewall, and cloud security; improve system and network performance; meet compliance requirements; and provide a wider array of network services to its users. Hear how Director of IT Gus Garcia provides reliable and adequate endpoint, network, and email security to the entire Diocese and why he thinks Intercept X provides the ultimate protection against the latest ransomware threats. With 75% of malware threats unique to a single organization, reactive endpoint security alone is not enough. Join this webinar to learn how predictive deep learning technology detects new and unseen malware, protecting you from never-seen-before attacks. Hear from security experts on the latest malware trends and attack techniques. Keeping students safe while on the Internet is one of Technology Instructional Facilitator Kathy Wise’s top priorities. Listen to Kathy describe how Sophos’ integrated solutions help the school district meet federal compliance requirements, all while keeping staff and students safe from advanced threats. The majority of Network traffic is unidentifiable by network firewalls. Which means ransomware, advanced threats, and active adversaries are happily entering your network. Why? Because every firewall on the market uses application signatures to identify traffic passing through the firewall. Except Sophos. We can identify every application passing through the firewall thanks to Synchronized App Control. In this webcast, we’ll look at the top problems with firewalls today and what you should be looking for in your next firewall. Check out this short video to get practical tips on how to avoid the phishing bait. Sophos Intercept X detects ransomware via the powerful CryptoGuard feature, which identifies and stops the spontaneous malicious encryption of files. A brief preview of how Sophos Intercept X utilizes deep learning technology to deliver unmatched next-gen endpoint protection. From ransomware to rootkits, old school security cannot keep pace with today’s advanced attacks. Organizations need innovative endpoint protection that won’t impact performance while at the same time protect against these targeted threats. Join us for a live webcast as we discuss the latest in ransomware trends. Sophos makes IT security simple with next-generation solutions that protect networks, servers, and devices, wherever they are. Today, more than 100 million users in 150 countries and a global network of channel partners trust Sophos to deliver simple solutions to complex security challenges. Focused on innovation and backed by a global network of SophosLabs threat intelligence centers and industry-leading support, Sophos delivers solutions that are simple to deploy, maintain, and manage, enabling organizations to focus on performance and growth. Sophos — Cybersecurity made simple.